In the development of fiber optic technology over the last 30 years, many companies and individuals have invented the "better mousetrap" - a fiber optic connector that was lower loss, lower cost, easier to terminate or solved some other perceived problem. 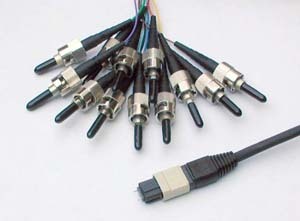 In all, about 100 fiber optic connectors have been introduced to the marketplace, but only a few represent the majority of the market. Here is a rundown of the connectors that have been the leaders of the industry. The big silver connector at the bottom of the photo at the right is the Deutsch 1000, what was probably the first commercially successful fiber optic connector. It was really a "pin vise" holding a stripped fiber. The nose piece is spring loaded and was pushed back when the connector was inserted into a mating adapter. The fiber stuck out into a drop of index matching fluid on a plastic lens. This solution was state of the art in the late 70s, yielding about 3 dB loss. 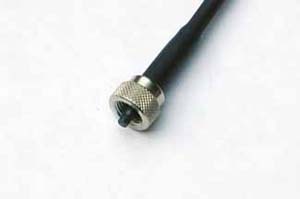 Many users remember it as the connector on the front panel of the original Tektronix OTDR. Above it is the Biconic, the yellow body indicating a SM version. Developed by a team led by Jack Cook at Bell Labs in Murray Hill, NJ, the Biconic was molded from a glass-filled plastic that was almost as hard as ceramic. It started with the fiber being molded into the ferrule. This lasted until the company could get a 125 micron/5mil pin insert into the plastic mold, at which point the fiber was glued into the ferule with epoxy. When singlemode versions first appeared, the ferrules were ground to center the fiber core in the ferrule to reduce loss. Since it was not keyed and could rotate in the mating adapters, it had an airgap between the ferrules when mated, meaning loss was never less than 0.3 dB due to fresnel reflection. Usually MM Biconics had losses of 0.5-1 dB and SM 0.7 dB or higher. 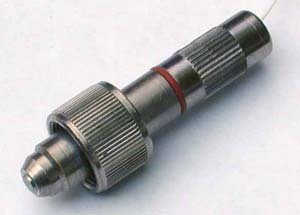 The advent of the ceramic ferrule in the mid-80s in Japan changed the connector designs forever. The ceramic ferrule was hard and precise. Fibers were accurately located for alignment and ferrules could be allowed to touch. 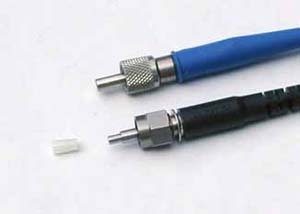 Adding in convex ferrules for PC (physical contact) between connectors reduced losses to levels below 0.3 dB for both MM and SM varieties. 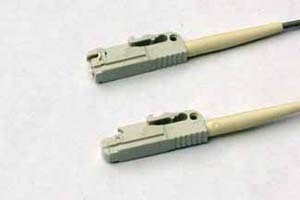 In the late 90s, small form factor (SFF) connectors became popular, but only the LC (top) has been a runaway success, both in telcos and high bit rate LANs, SANs, etc. 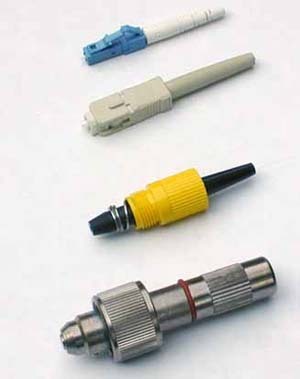 Below are some more of the popular connectors over the years. 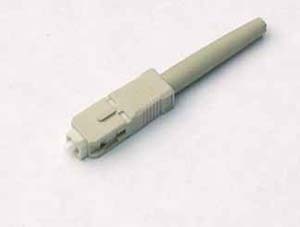 ST (an AT&T Trademark) is probably still the most popular connector for multimode networks (ca. 2005), like most buildings and campuses. 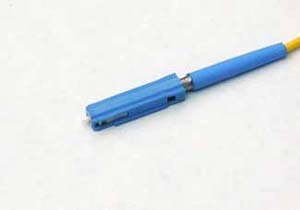 It has a bayonet mount and a long cylindrical 2.5 mm ceramic (usually) or polymer ferrule to hold the fiber. Most ferrules are ceramic, but some are metal or plastic. And because they are spring-loaded, you have to make sure they are seated properly. If you have high loss, reconnect them to see if it makes a difference. 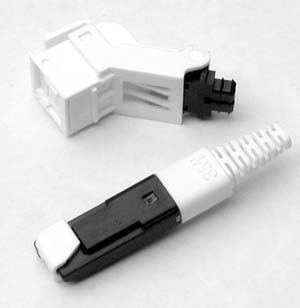 The ST/SC/FC/FDDI/ESON connectors have the same ferrule size - 2.5 mm or about 0.1 inch - so they can be mixed and matched to each other using hybrid mating adapters. This makes it convenient to test, since you can have a set of multimode reference test cables with ST or SC connectors and adapt to all these connectors. 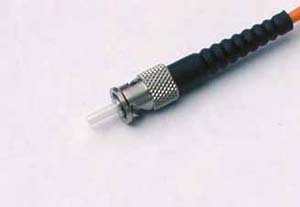 SC is a snap-in connector also with a 2.5 mm ferrule that is widely used for it's excellent performance. 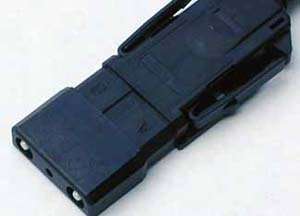 It was the connector standardized in TIA-568-A, but was not widely used at first because it was twice as expensive as a ST. Now it's only a bit more expensive and much more common It's a snap-in connector that latches with a simple push-pull motion. It is also available in a duplex configuration. LC is a small form factor connector that uses a 1.25 mm ferrule, half the size of the SC. 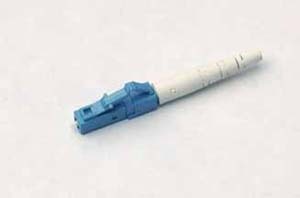 Otherwise, it's a standard ceramic ferrule connector, easily terminated with any adhesive. Good performance, highly favored for singlemode. The LC, MU and LX-5 use the same ferrule but cross-mating adapters are not easy to find. Besides the SC Duplex, you may occasionally see the FDDI and ESCON* duplex connectors which mate to their specific networks. They are generally used to connect to the equipment from a wall outlet, but the rest of the network will have ST or SC connectors. 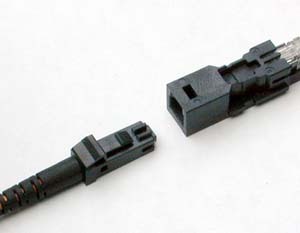 Since they both use 2.5 mm ferrules, they can be mated to SC or ST connectors with adapters. 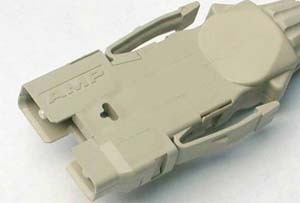 The Panduit Opti-Jack is a neat, rugged duplex connector cleverly designed aournd two ST-type ferrules in a package the size of a RJ-45. It has male and female (plug and jack) versions. 3M's Volition is a slick, inexpensive duplex connector that uses no ferrule at all. It aligns fibers in a V-groove like a splice. Plug and jack versions, but field terminate jacks only. LX-5 is like a LC but with a shutter over the end of the fiber. 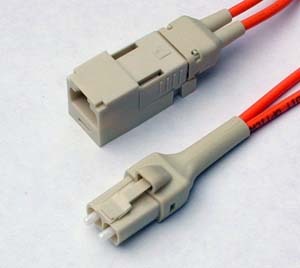 MT is a 12 fiber connector for ribbon cable. It's main use is for preterminated cable assemblies and cabling systems. Here is a 12 fiber MT broken out into 12 STs. 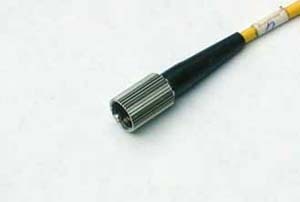 Deutsch 1000 was probably the first commercially successful fiber optic connector. It was really a "pin vise" holding a stripped fiber. The nose piece is spring loaded and was pushed back when the connector was inserted into a mating adapter. The fiber stuck out into a drop of index matching fluid on a plastic lens. This solution was state of the art in the late 70s, yielding about 3 dB loss. 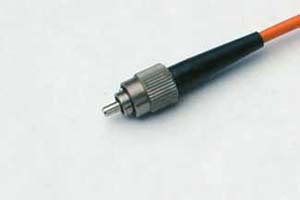 Many users remember it as the connector on the front panel of the original Tektronix OTDR. This is the Biconic, the yellow body indicating a SM version - MMs were usually black. Developed by a team led by Jack Cook at Bell Labs in Murray Hill, NJ, the Biconic was molded from a glass-filled plastic that was almost as hard as ceramic. It started with the fiber being molded into the ferrule. This lasted until the company could get a 125 micron/5mil pin insert into the plastic mold, at which point the fiber was glued into the ferule with epoxy. When singlemode versions first appeared, the ferrules were ground to center the fiber core in the ferrule to reduce loss. Since it was not keyed and could rotate in the mating adapters, it had an airgap between the ferrules when mated, meaning loss was never less than 0.3 dB due to fresnel reflection. Usually MM Biconics had losses of 0.5-1 dB and SM 0.7 dB or higher. Jacj Cook retired from Bell Labs and started Dorran Photonics which became 3M fiber optics. The AMP optimate was popular in the early 80s. It used a conical plastic ferrule and screw-on nut. It was available for every fiber size including plastic fiber. Some may still be in use in utility and industrial systems.